libc6, Mesa 3.0 and above. Supports (or needs) hardware accelerated graphics e.g. with XFree86 4.0. Type ldd jongl for a detailled list of needed libraries. 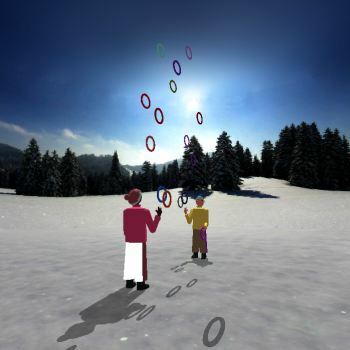 jongl-14.0-linux.tgz 6.722.612 bytes Jongl V14.0 for Linux, complete package including textures and one panorama. Dynamically linked. Tested successfully on SuSE 9.0 and debian sarge. See Ludwigs homepage for all of the panoramas. jongl-9.0-data.tgz 451.954 bytes Jongl V9.0 data (must have). jongl-9.0-textures.tgz 702.670 bytes Jongl V9.0 textures (optional). Requirements: A PowerPC computer and LinuxPPC running on it. Details here. Currently this is the only way to run Jongl on a Mac (without using an emulator). Requirements: IRIX 6.3 and 6.5. Tested on O2, Octane and Onyx. If you have any problems with or questions belonging to the IRIX version, please ask Pelle. David writes: I've tested it on Solaris 7 (SunOS 5.7) using both the standard OpenGL libraries and Mesa 2.2 (there are two executables in the tar file.) I don't have access to older Solaris versions, and I don't have access to Sun machines without a 3D card, so I don't know if it will work on such machines. If you have any problems with or questions belonging to the SunOS version, please ask David. Jongl for Windows. No installation is needed; just extract the files in any writeable directory and double click on jongl.exe. To uncompress the archives, you will need a program which is able to handle zipped archives, like PowerArchiver or WinZip. Ported by Martin Hoffmann, Thomas Ruhroth and Werner Riebesel. Some hints from Ludwig Klam. JonglV14.8-windows-patch.zip 406.246 bytes Patch to update Jongl V14.0 to V14.8 for Windows. Contains 2 new features, though not completely implemented. a) Boston Mess operator: works on siteswap patterns (see article in Kaskade issue 91, 03/2008 ). Unzip contents of archive and copy them into JonglV14.0 directory. Accept all files to be overwritten. JonglV14.0-windows.zip 8.156.230 bytes Jongl V14 for Windows. 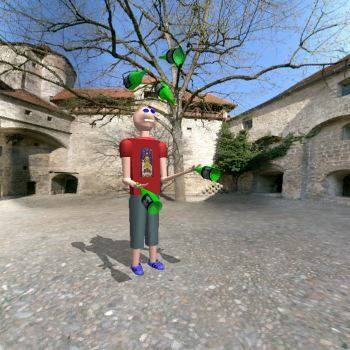 Including textures, T-Shirts and some of the panoramas. See Ludwigs homepage for all of the panoramas. JonglV13.0-windows.zip 5.921.714 bytes Jongl V13 for Windows. Complete package with textures; e.g. all the T-Shirts of the European Juggling Conventions from 1989 to 2004.
jonglV12pre-windows.zip 3.484.960 bytes Jongl V12 alpha for Windows® XP. Almost complete package. Perhaps you might also need msvctrd.dll. jongl-8.0.1-windows.zip 769663 bytes Jongl V8.0.1 for Windows® 95/98/ME/NT4.0/2000/XP. Click here to see which dlls JonglV8.x needs. Requirements: A 68030 CPU with a 68881 FPU or 68040 or 68060 CPU. j2_patch3.zip 29510 bytes Sources of Jack Boyces program j2. 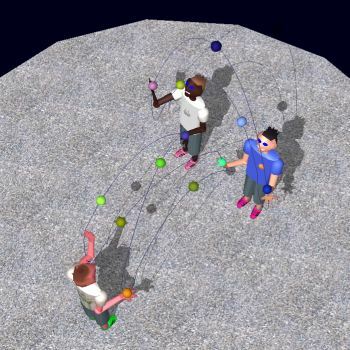 It computes all possible patterns with given number of objects, hands and maximum height of throw. Passing is possible, too. Since V9.0 it is included in the jongl-GUI. Patch 3: Some changes for integration into Jongl. 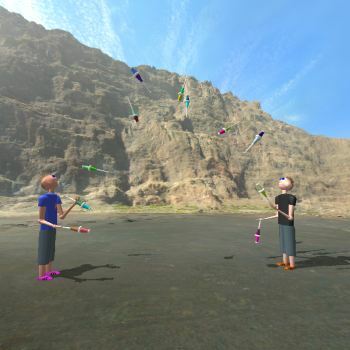 jongl-9.0-AC3Dobjects.tgz 123151 bytes All of the jugglers and objects, made with my favourite 3D editor AC3D. gifmerge_tar.gz 5566 bytes Source of gifmerge which makes animgifs from a series of single pics. mpeg2encode.zip 62576 bytes Source of mpeg2 encoder. Produces a mpeg2 video from a series of single pics. povray.zip 10202 bytes Data required for rendering povray movies. s22j_beta15.zip 36524 bytes Sources of the siteswap to jongl converter S22J beta 15. All mentioned trademarks belong to their respective owners. The size of the logos has nothing to do with our personal rating of the operating systems. They are just grabbed. Check out the benchmarks to see how "fast" Jongl runs.